Along with New Year’s resolutions and ‘Hot for 2015’ lists, tips for updating your wardrobe are a quintessential part of the first week of any new year. Nothing screams “I’m ready for 2015” like a new look in January. While keeping up with trends is a crucial part of refreshing your wardrobe, mixing things up is so much more than buying Marsala everything. If you’re not quite sure how to try out new looks without breaking the bank, here are some tips to do it at any time of the year, no matter what the trends may be. 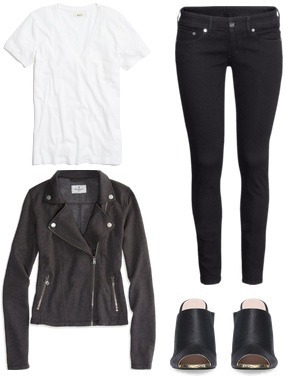 I’m starting with a combination of wardrobe basics that most college girls should own. Most of the items in this set lend themselves well to experimentation, and can easily be substituted with items you already have in your closet. 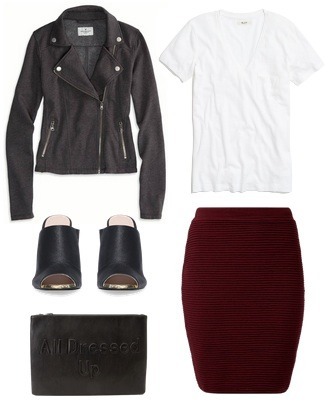 For example, if you don’t own a pair of mules, heeled ankle boots will also work with all the outfits in this post. If you’d like to venture out of your comfort zone but aren’t quite sure how to do it, I usually start with color. The easiest way to add color to an outfit is with a basic item in a color that you don’t already own, but also goes with everything else in your wardrobe. I went with this burgundy pencil skirt in the spirit of 2015’s Color of the Year. Sticking to a classic silhouette is the easiest starting point for experimentation, and any part of this outfit can easily be substituted for something else in a brighter hue or a different style. If you regularly incorporate color into your outfits, try experimenting with texture instead. My first instinct was to go with leather-look leggings, but I wanted to try juxtaposing the lightness of gauze with the edgier moto jacket. These asymmetrical pants add an element of surprise to an otherwise fuss-free ensemble of everyday basics. Playing with shapes and silhouettes is the easiest way to instantly look fashion-forward. I changed up two different aspects of the outfit, but going with either one still creates a huge impact. The asymmetric hem of the biker jacket makes it an investment piece that will play well with many other pieces, while elevating the ubiquitous moto jacket. A high-low skirt adds drama, but its black color ensures it won’t steal attention from the jacket. I kept the clothing pieces monochromatic to ensure the dramatic silhouettes meshed well together – but if you’re only going with one unusual shape, you can definitely throw loud pops of color into the mix! How do you intend to change up your look this year? 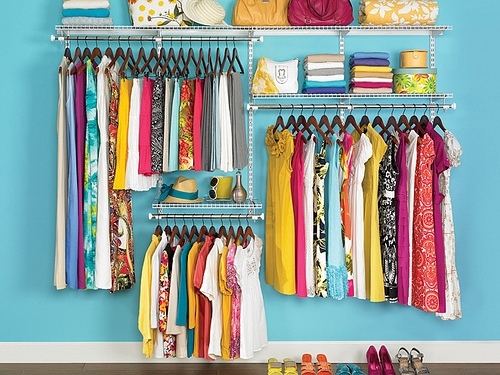 What’s your favorite way to instantly refresh your wardrobe? How do you incorporate new trends into your outfits? Let us know by commenting!